The NSU Art Museum in Fort Lauderdale, Florida holds the largest collection of the works of the late 19th and early 20th century American artist William Glackens. This came about as the result of gifts of some 500 works by the artist's son Ira Glackens and the Sansom Foundation. Any exhibition that features 25 works by one of the great Impressionist masters is bound to be successful. The Impressionists works are aesthetically beautiful and often profoundly moving. Furthermore, these works resonate with the public and such an exhibition is bound to be well-attended. The NSU Art Museum's exhibition, however, goes further than that. It demonstrates how the work of a master artist can have on the art of a subsequent generation. In the process, it confronts issues of influence, originality and imitation. Glackens was born in 1870 in Philadelphia, Pennsylvania, where his family had lived for several generations. He had an interest in art and drawing from an early age and after he graduated from the prestigous Central High School, he found work as an illustrator and sketch reporter for various newspapers. Interested in becoming a painter, Glackens took evening classes at the Pennsylvania Academy of Fine Arts. There he became friends with Robert Henri and other young artists who wanted to break away from the highly-polished art favored by the art establishment of the day. Rather than historical and classical subjects, these artists were interested in depicting scenes of modern, everyday life. In 1895, Glackens, together with Henri and others, traveled to Europe to study European art. Glackens set up his own studio and spent a year in Paris. Naturally, Glackens was attracted to the work of the Impressionists. They too had rebelled against the art establishment and had focused on scenes of everyday life. Although their work had intially been scorned by the critics, by the time Glackens arrived in Paris, there was growing interest in the work of the Impressionists. More than a generation younger than the Impressionist masters, Glackens did not become part of that group but rather was influenced by their work. Returning to the United States, Glackens took up residence in New York City. He continued to work as an illustrator but at the same time, he was painting. Together with Henri, John Sloan, George Luks, Arthur B. Davies, Ernest Lawson and Maurice Pendergast, Glackens became part of a group known as “The Eight.” In 1908, the group held a breakaway exhibition in protest of the definition of artistic beauty endorsed by the art establishment. The exhibition drew considerable attention and Glackens became a recognized artist as well as a successful illustrator. At the same time, however, Glackens began to move away from the ”Ashcan School” towards pure Impressionism. In 1908, Glackens viewed an exhibition of 41 Renoir paintings at the Durand-Ruel Gallery in New York City. He was so impressed that he wrote to the gallery requesting information about Renoir's palette and the colors the French master used. In addition, in 1912, Glackens traveled to Paris to purchase paintings for the collection of his boyhood friend Albert C. Barnes. Among the purchases were paintings by Renoir. Glackens' work had long been influenced by the modern French masters. For example, his “Portrait of the Artist's Wife” (1904) and “Chez Mouquin's” (1906) show the clear influence of the work of Edouard Manet. However, as the exhibition at the NSU Art Museum chronciles, Glackens' later work became more and more influenced by Renoir both in colors used and subject matter. It would be wrong to dismiss Glackens as a mere imitator of Renoir. While in many of his works on exhibit are similar in technique and subject matter to Renoir's works, there are distinctions. For example, Renoir's nudes have a somewhat other-worldly atmosphere whereas Glackens are clearly contemporary American women. In general, Renoir had a lighter overall approach than Glackens. 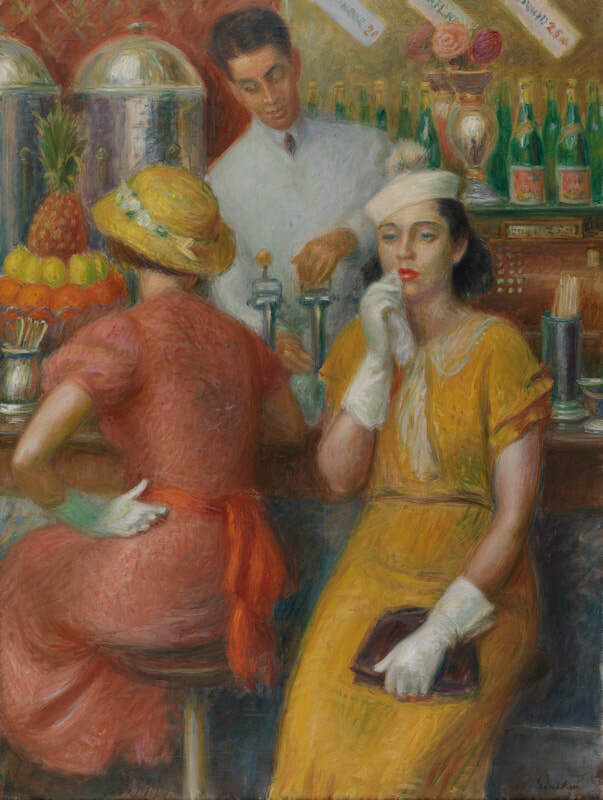 The originality in Glacken's work is most clear in “The Soda Fountain.” The colors used by Glackens are like Renoir's palette and this scene of contemporary American life recalls Renoir's scenes of Parisian riverside cafes. However, the prominet placement of the figures as in a closely cropped snapshot is not Renoir's. Moreover, the scene is clearly observed with 20th century eyes rather than 19th century eyes. There is, of course, an inherent risk in exhibiting the work of even an established artist along with works by one of the great geniuses of art. 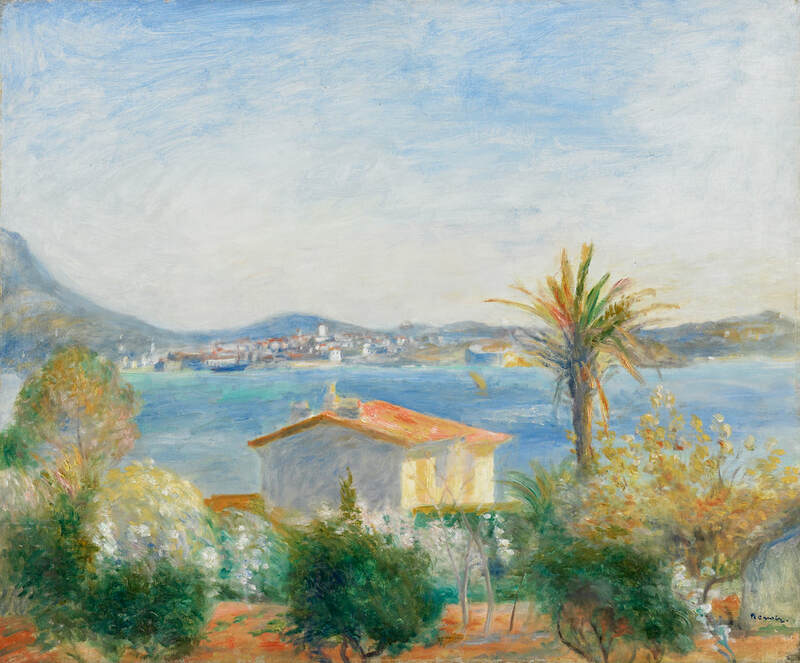 However, in this exhibition we see an example of the legacy of Renoir and how his work contributed to the development of subsequent art. Furthermore, while Glackens is not Renoir, the process of making the comparison reveals the depth of Glackens art.